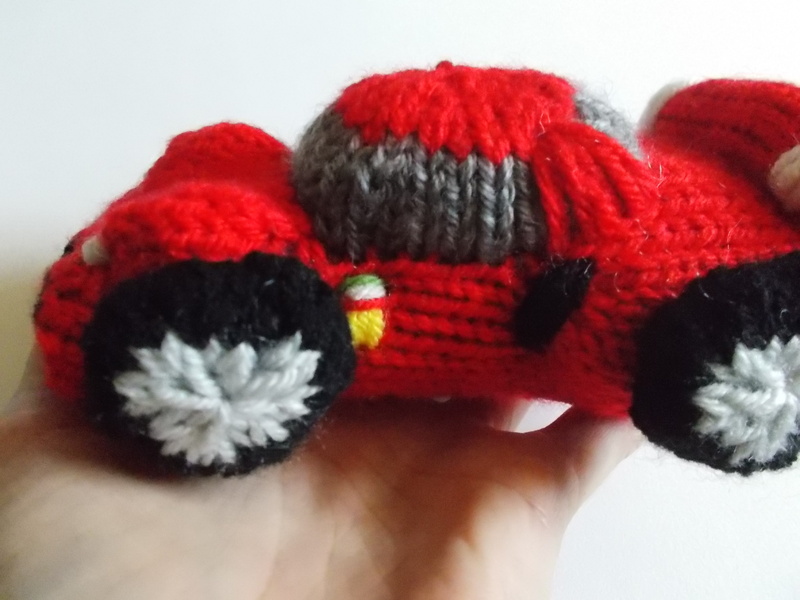 Free Pattern Fridays – Knitted “Ferrari” Sports Car! I’m always putting the offer out there for toy design requests – and someone finally took me up on it! 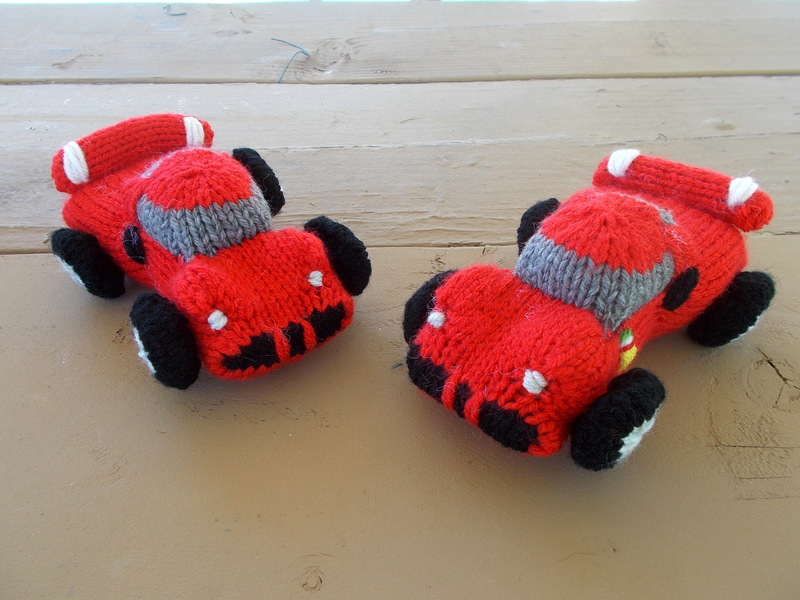 A very kind and always-supportive friend on Ravelry had a dream of knitting a Ferrari! I have to say I don’t blame her – they make beautiful cars! The request was somewhat of a coincidence, seeing as I had been looking at Ferraris (images of them, not the real thing, unfortunately) a few weeks ago in a quest to design a fancy sports car. I put it on the back burner after a few design failures, but this request made me revisit it, and I’m super glad I did! So, as a gift to my friend … and to you as well, I’m sharing the pattern here on Free Pattern Friday! I know you and your family are going to love these cars as much as I do. It’s based loosely on the Enzo model and its racing equivalent, the FXX. In the R&D phase of this pattern, I learned that Ferraris are often painted red because that was the official race car color of Italy. In the days before racing sponsorships were common, color was used to identify what country a particular car was racing for. Even though the colors aren’t a standard in international races anymore, the Ferrari racing team has stuck with the tradition of painting their cars red. The association of Ferrari with the color red is such a strong one that it seems to carry over into their street-legal vehicles as well – with most people opting for the classic red paint job. 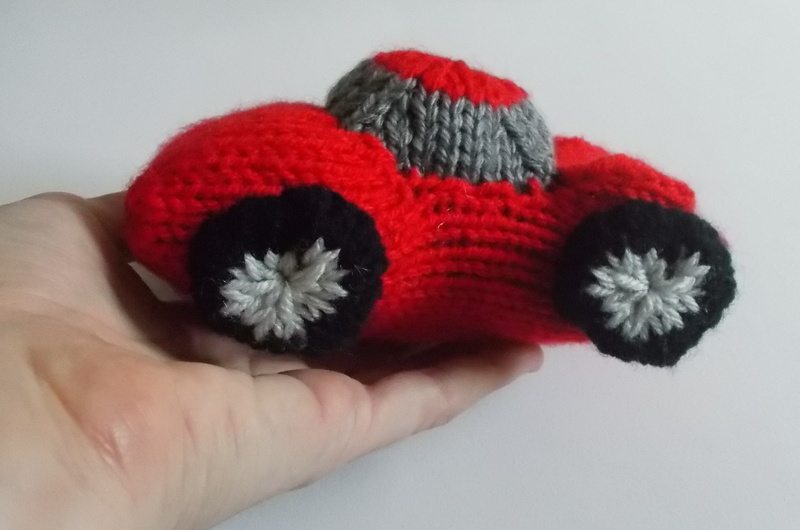 However, if you want to break with tradition and use a different color yarn for your car model, that’s entirely up to you! Other than a stylized Ferrari logo, I’ve left my models as a clean slate – but you can add additional details like racing numbers, stripes, etc. 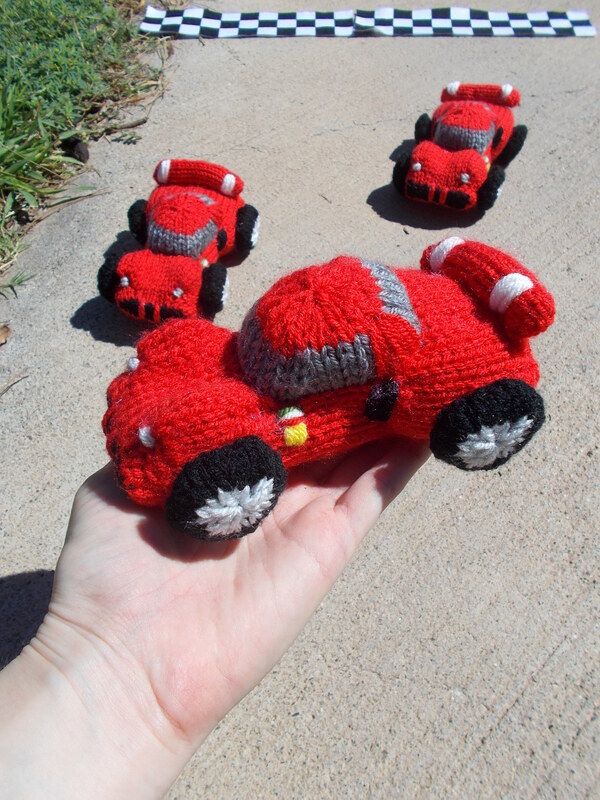 Perhaps the best part of this pattern – you can make one and tell all your friends that you just got a Ferrari! Wait for the jaws to drop, then smile and produce this model from your bag! 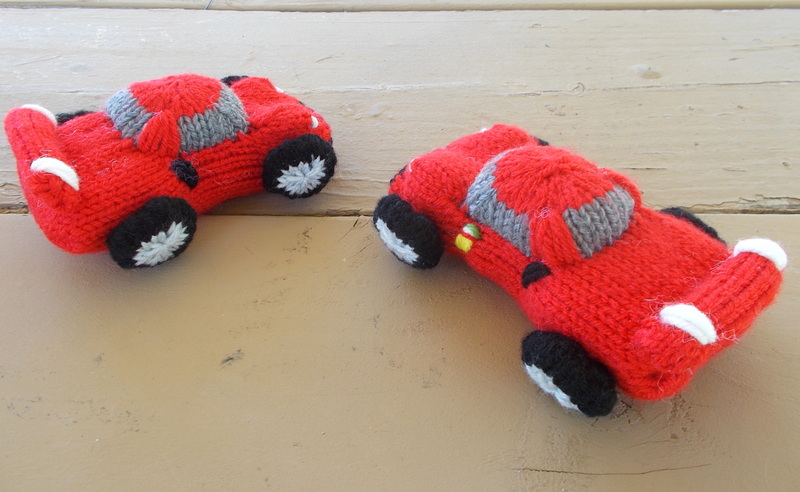 When knitted with worsted weight yarn, the cars measure about 6 inches long. Enjoy! Using Black Yarn and leaving a tail for seaming, cast on 24 stitches onto three dpns and join to knit in the round. Rnd 1: Knit 1 round. 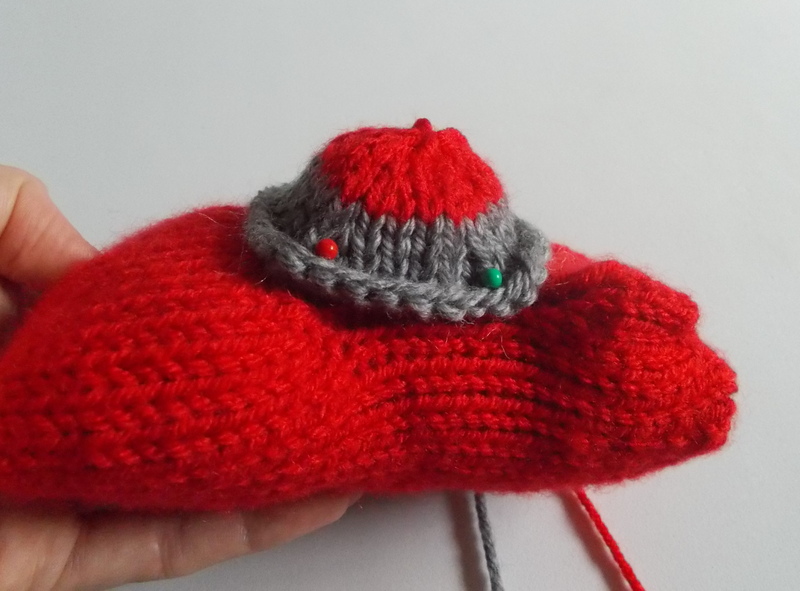 -Cut the Black Yarn, join in the Red Yarn and continue to work with red. Rnd 2-4: Knit 3 rounds. Rnd 8-12: Knit 5 rounds. Rnd 16-25: Knit 10 rounds. Rnd 29-43: Knit 15 rounds. 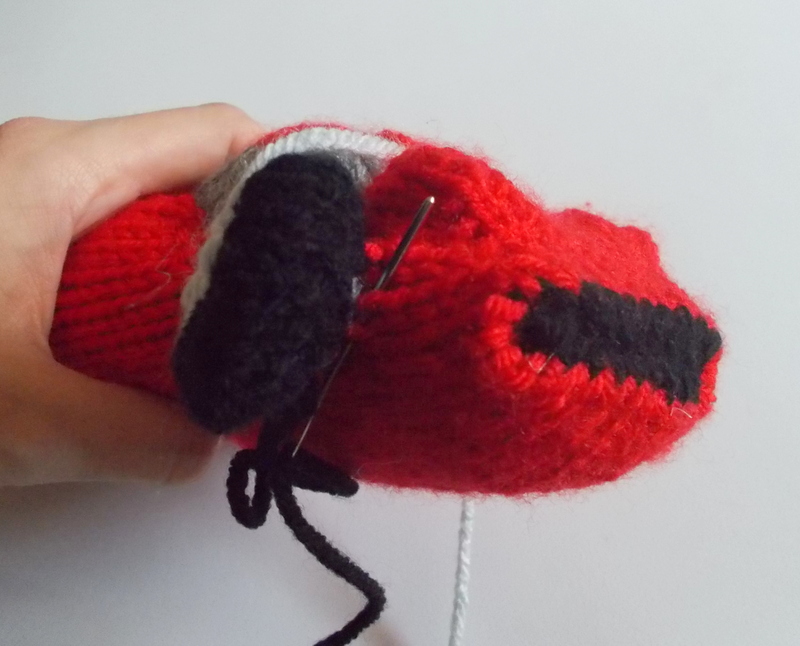 -Knit only the first 4 stitches of the next round then cut the red yarn, leaving a tail for seaming. Distribute the stitches evenly onto 2 needles (18 stitches per needle) with the working yarn coming off the rightmost stitch on the back needle. -Using the tail, seam the two sets of stitches using Kitchener Stitch. -Stuff the car chassis, making sure to fill out the back section and the front wheel wells. 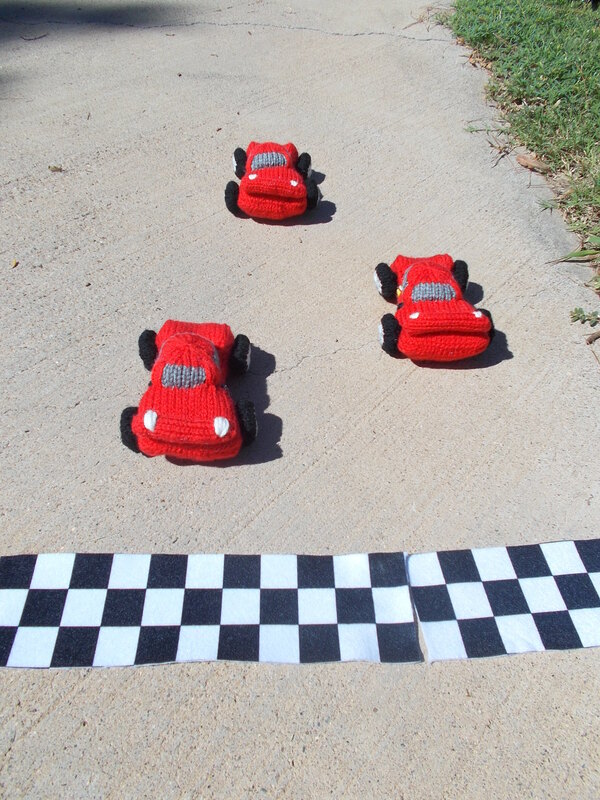 -Using the cast on tail, seam the open cast on edge using mattress stitch, adding additional stuffing to the front of the car as needed before closing the seam. -Weave in the ends. The front seam may have a slight overhang, so when weaving in the front end tail, pull it tightly to “sink” this overhang into the body before weaving through the body a few more times to secure. Using Dark Gray Yarn and leaving a tail for seaming, cast on 32 stitches onto three dpns and join to knit in the round. Rnd 3: Knit 1 round. 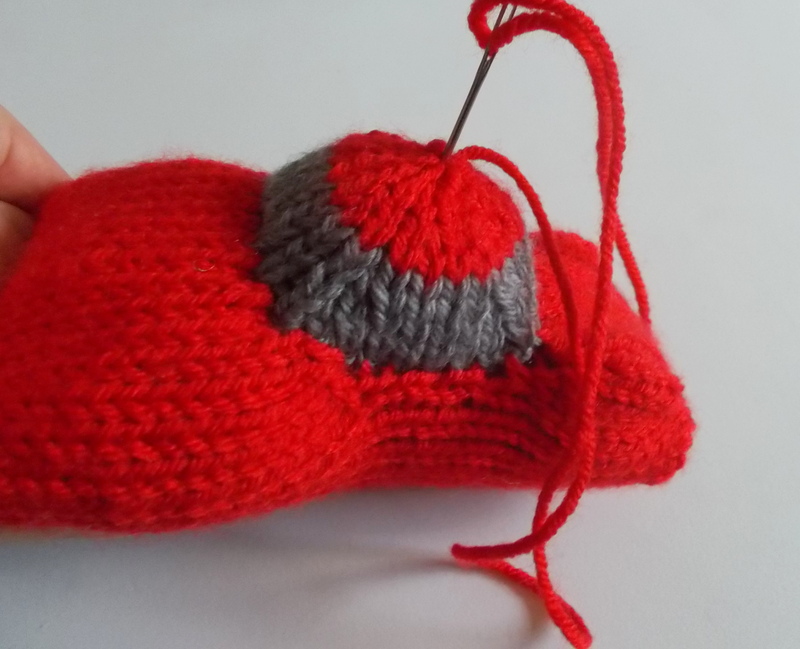 -Cut the Dark Gray yarn and join in the Red Yarn. 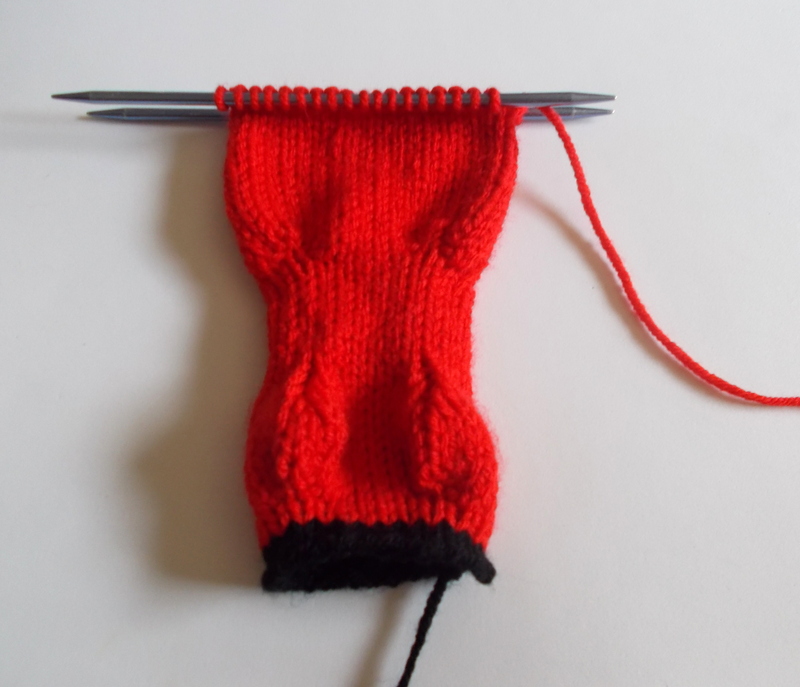 Proceed to knit with Red. Rnd 5-6: Knit 2 rounds. Rnd 8: Knit 1 round. 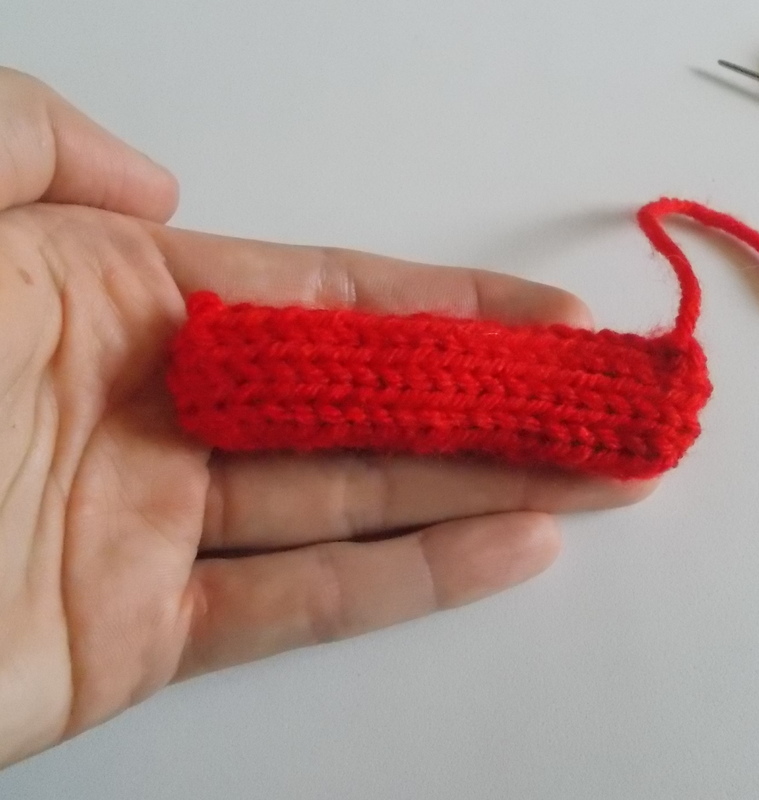 -Cut the Red yarn, thread the tail into a tapestry needle and weave through all stitches on the needles, pulling tightly to close. -Lightly stuff the cab piece and pin it in place on top of the chassis, just behind the front wheel wells. The cab piece should be slightly squared off, with the decrease seams facing the sides of the car body. -Seam the cab to the chassis using the tail and mattress stitch. 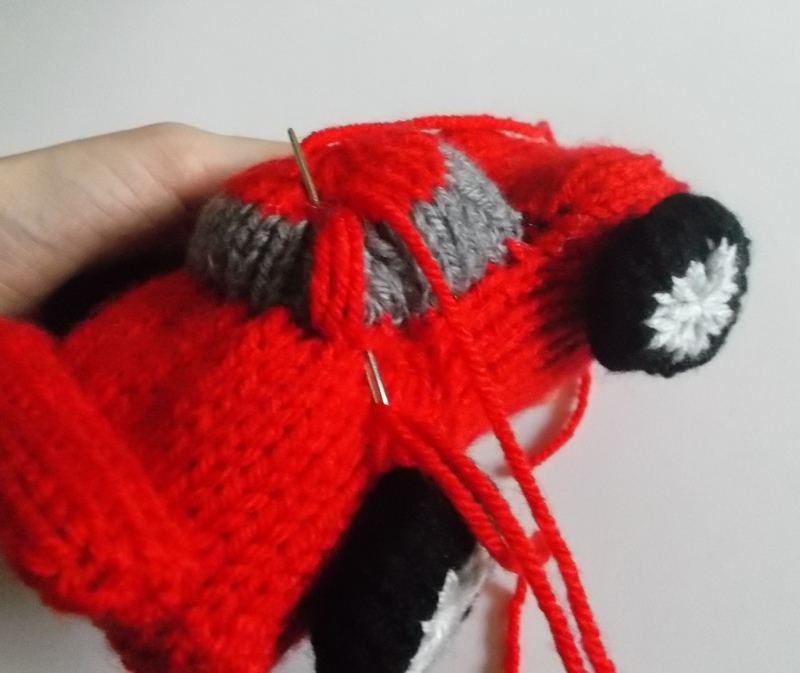 You can add additional stuffing to the cab before closing the seam if necessary. Weave in the end. -Thread the red cab closing tail into a tapestry needle and weave it down into the closed-up hole at the top of the cab, pulling tightly to flatten out the top before weaving through the cab a few more times to secure. 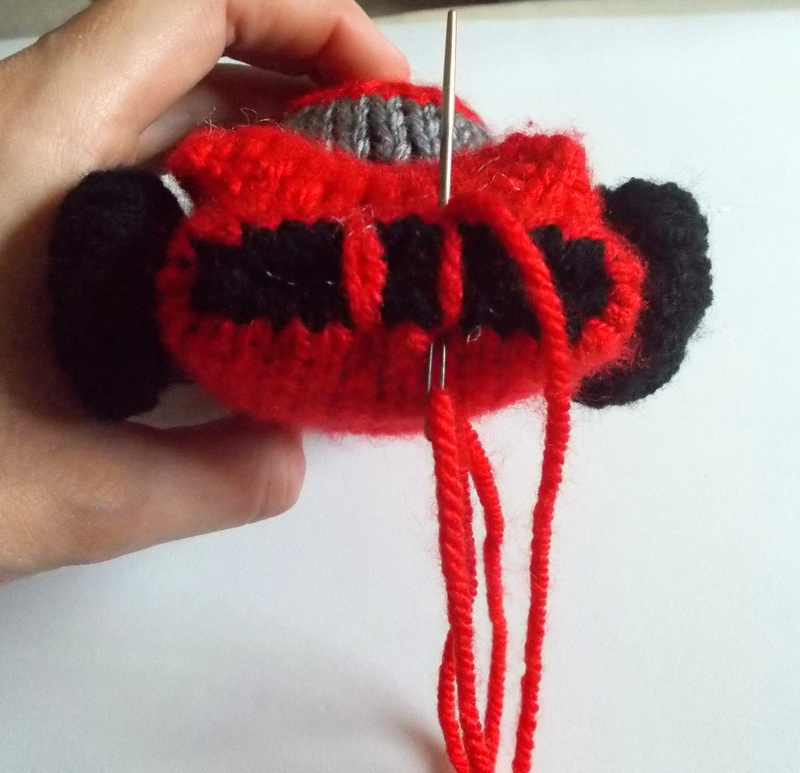 Using Black Yarn and leaving a tail for seaming, cast on 8 stitches onto three dpns and join to knit in the round. Rnd 2: Knit 1 round. Rnd 4: Knit 1 round. 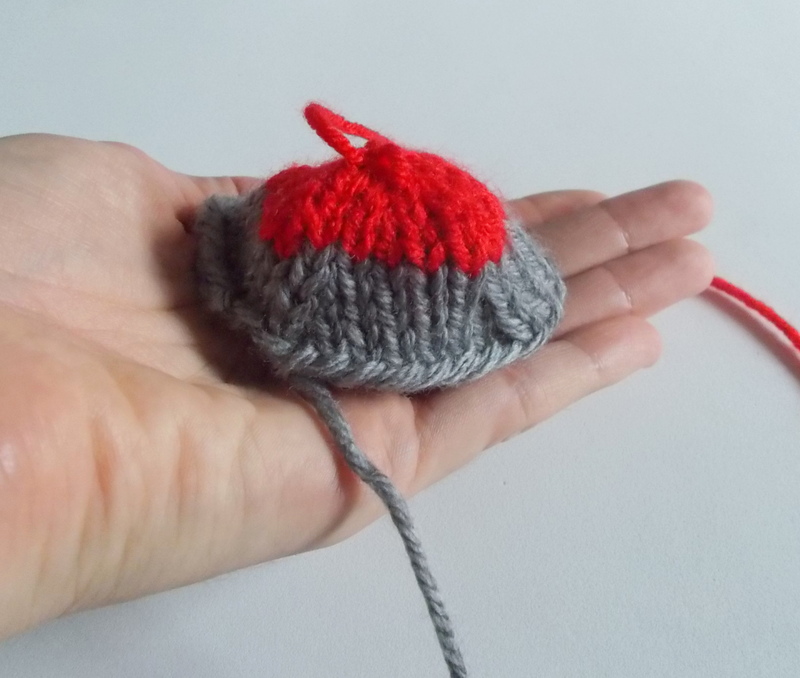 -Cut the Black Yarn and join in the Light Gray Yarn. Proceed to work with Light Gray. Rnd 6: Knit 1 round. -Cut the light gray yarn, thread the tail into a tapestry needle and weave through all stitches on the needles, pulling tightly to close. -Make 3 more tires in the same manner. -Press the tire flat, with the gray hubcap centered and facing outward. -Align the tire along the side of the body, underneath the wheel well at the front of the chassis. 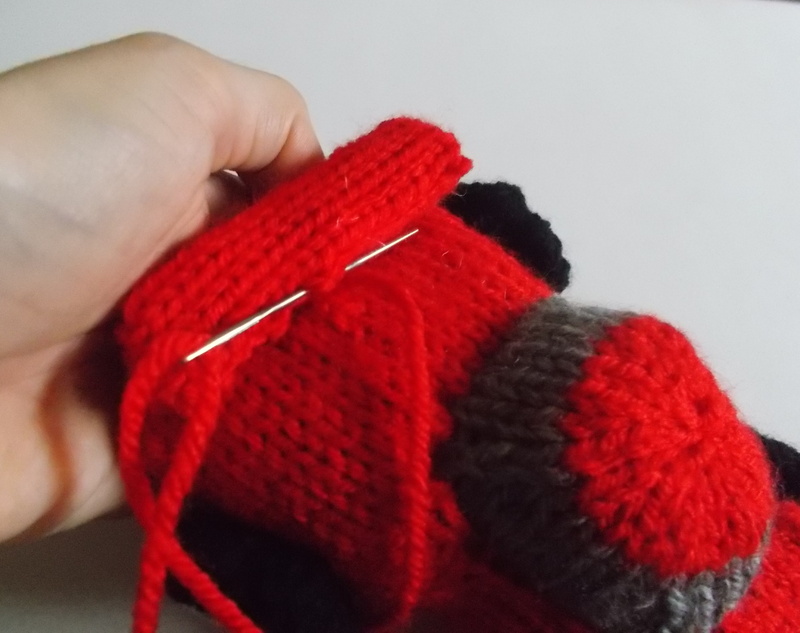 -Using the cast on tail, seam the wheel to the body with a few stitches. Weave in the end. -Thread the Light Gray closing tail into a tapestry needle and weave it into the closed-up hole at the center of the hubcap and down through the tire into the body. Pull tightly to flatten out the tire before weaving the end through the body a few more times to secure. -Attach the back tire in the same manner, in line with the front tire and near the rear of the chassis. -Attach the other two tires in their appropriate places on the opposite side of the toy. 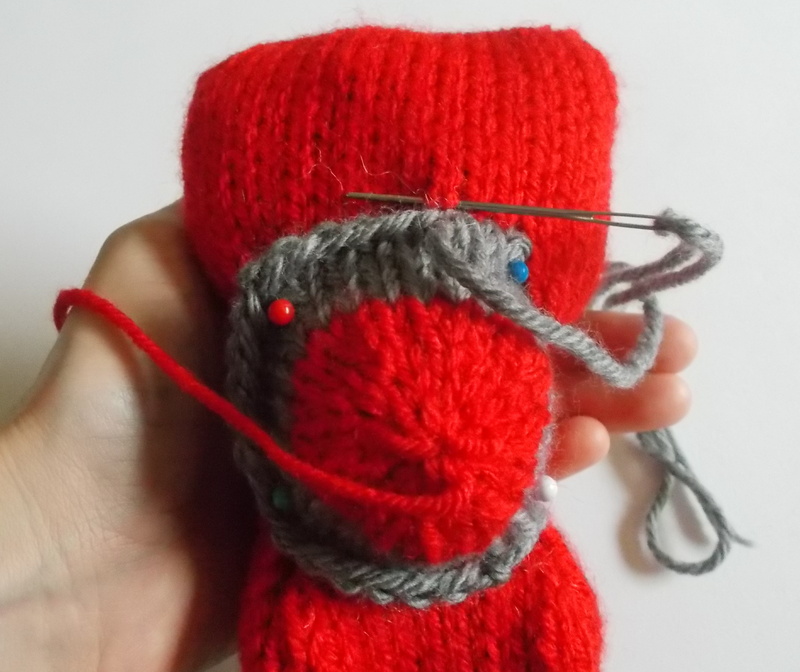 Using Red Yarn and leaving a tail for seaming, cast on 8 stitches onto three dpns and join to knit in the round. Rnd 1-20: Knit 20 rounds, stuffing lightly as you go. -Cut the yarn, leaving a tail for seaming. Distribute the stitches evenly onto 2 dpns (4 stitches per needle) with the tail coming off the rightmost stitch on the back needle. -Seam the two sets of stitches together using Kitchener Stitch. Weave in the end. -Thread the cast on tail into a tapestry needle and seam the cast on edge using mattress stitch. Do not weave in this end just yet. -Position the spoiler on the rear end of the chassis. 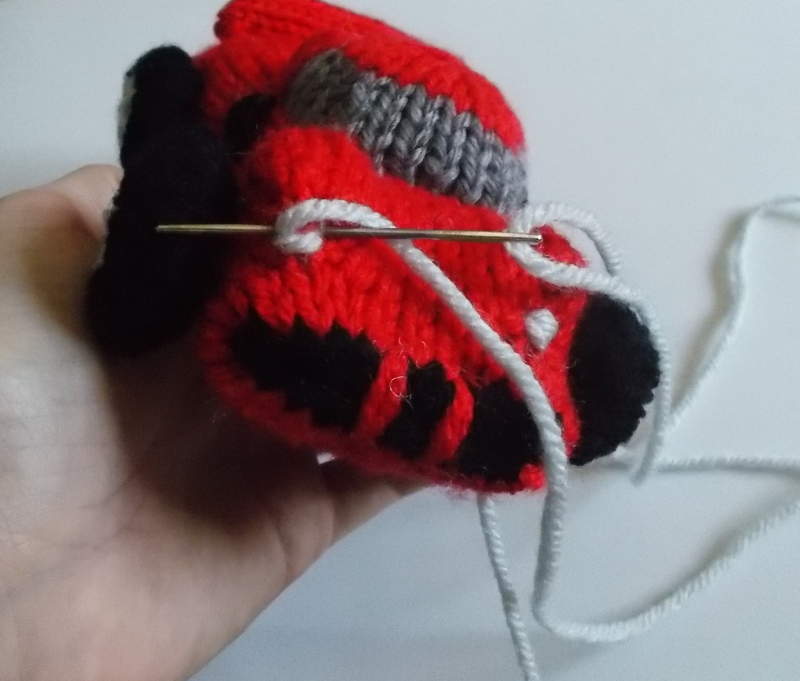 Using the cast on tail you left on the spoiler, attach the spoiler to the body with a few stitches along the spoiler’s length. Weave in the end. -Thread a length of red yarn into a tapestry needle and make 6 or 7 long straight stitches at the two back corners of the cab, stretching from the color change at the top of the cab down to the point where the cab was attached to the chassis. Weave in the ends. 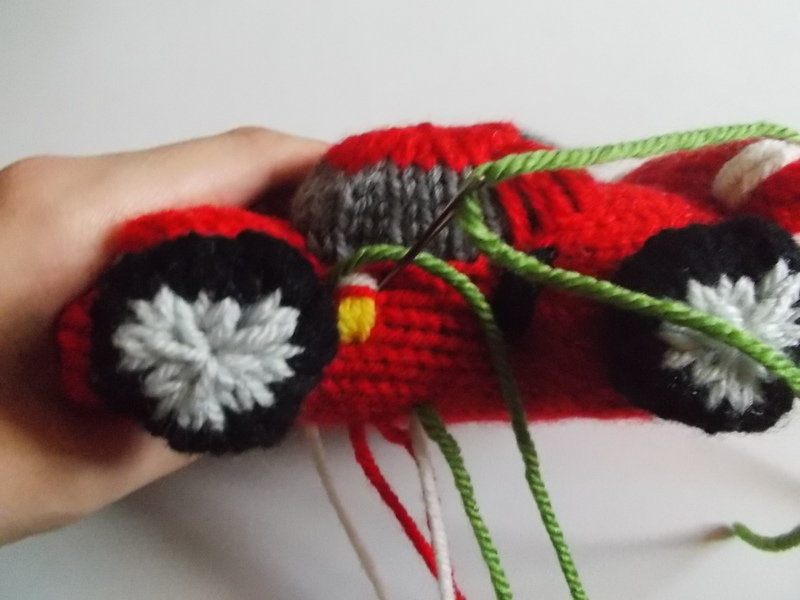 -Thread a length of red yarn into a tapestry needle and make two sets of 2 vertical straight stitches spanning the black grill at the front of the toy. These two sets of stitches should be about 2 stitches apart. Weave in the ends. 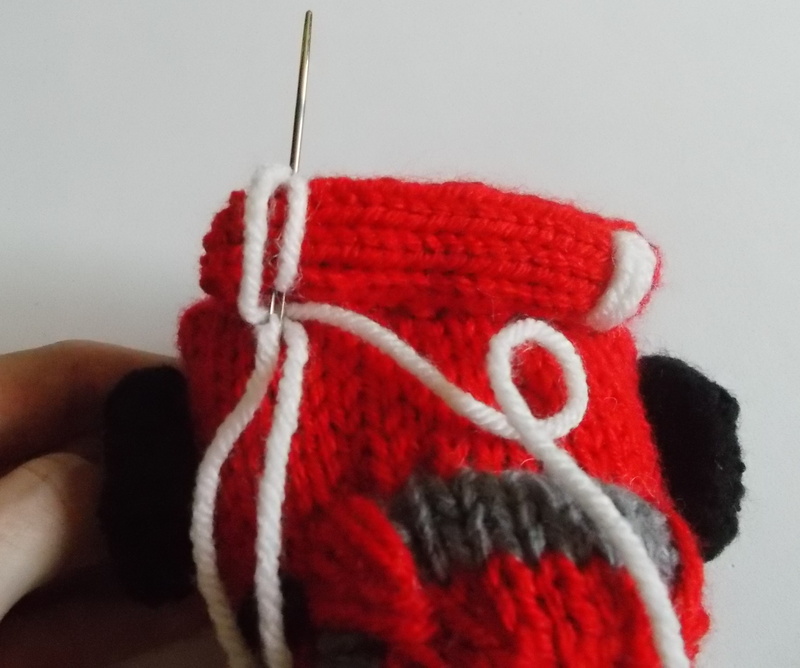 -Thread a length of black yarn into a tapestry needle and make 4 long straight stitches near the back of the body, just in front of the back wheel wells and underneath the cab. Repeat on the other side of the cab. Weave in the ends. 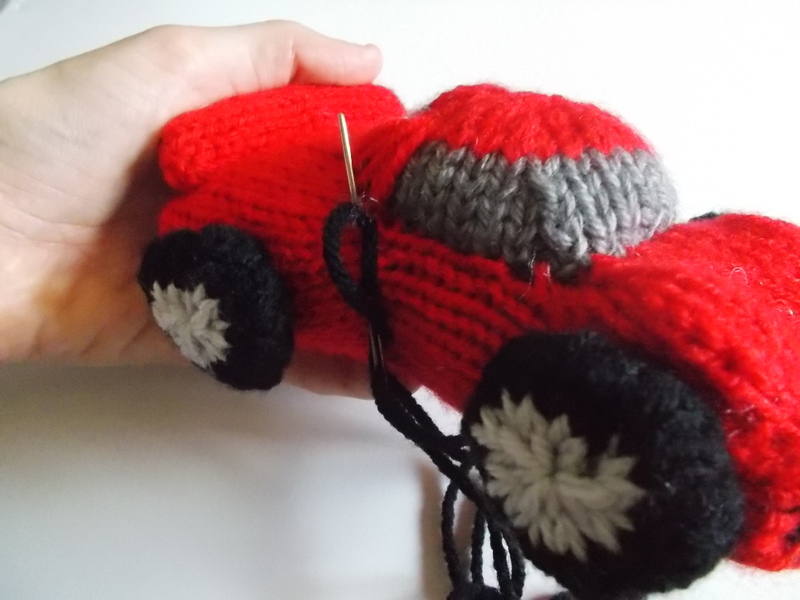 -Thread a length of light gray yarn into a tapestry needle and make 3 small stitches at the front edge of one of the front wheel wells to make a headlight. Repeat on the front of the other wheel well to make the other headlight. Weave in the ends. -Thread a length of white yarn into a tapestry needle and make 2 sets of 4 long straight stitches near the edges of the spoiler. Weave in the ends. 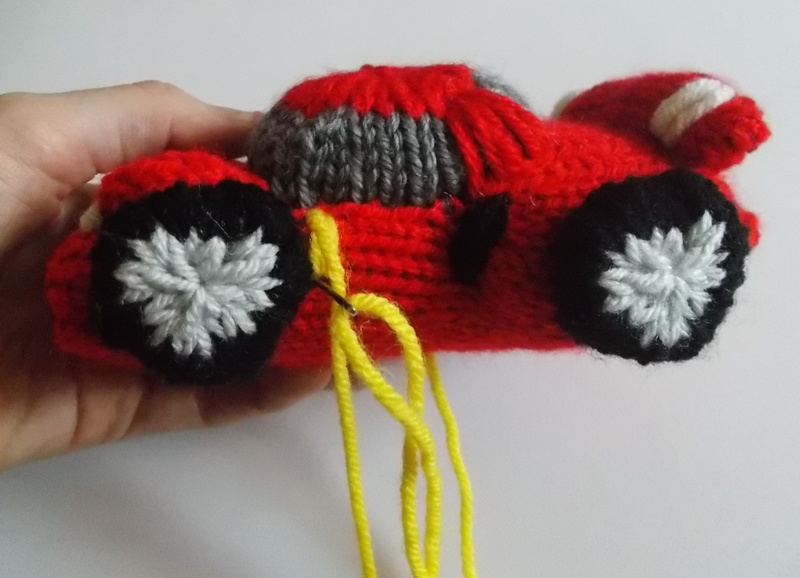 -(Optional “Ferrari Logo) Thread a length of yellow yarn into a tapestry needle and make 3 straight stitches across 2 knitted stitches just behind the front wheel, on one of the “doors” of the car. Weave in the ends. Make one stitch each across the top of the yellow stitches in red, white and green as shown. Weave in the ends. There you have it! Add any additional decorative touches you’d like and enjoy your new car! I hope you enjoyed this week’s pattern! 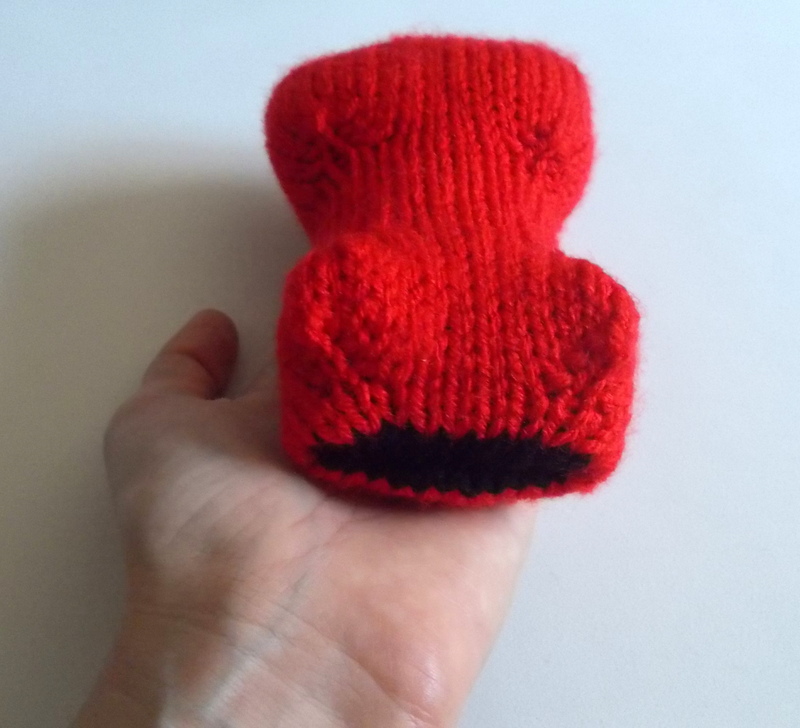 I’ll offer again – if you ever have anything you’ve dreamed of seeing as a knitted toy, let me know! I love to hear about the types of things that interest my readers! I can’t guarantee that everything you request will show up in pattern form here, but it never hurts to ask. 🙂 Sometimes I feel a little bit like a clown at the birthday party – making balloon animals on request. 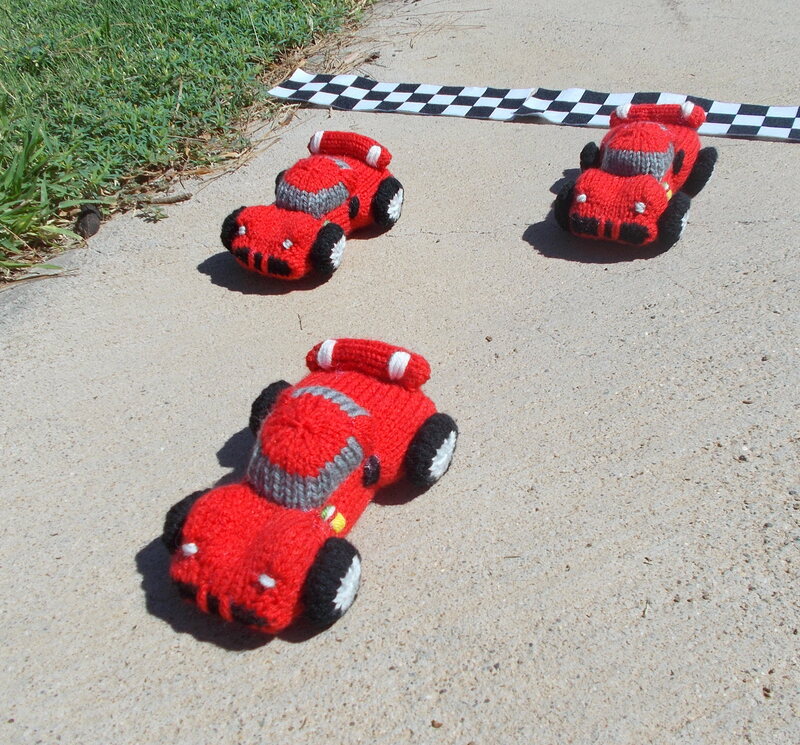 Of course, knitted toys take much longer to make, but the idea of starting from nothing and creating something fun and joyous is definitely the same! 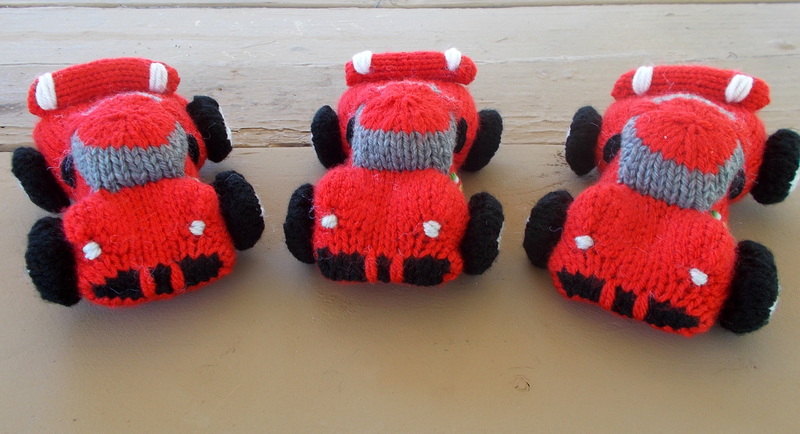 And, as always, feel free to check out Ravelry and Etsy for other toys and patterns I have available! I also encourage you to share this pattern link and my blog with your social networks and anyone you think may enjoy it! Thanks so much for visiting and I hope you have a great weekend! 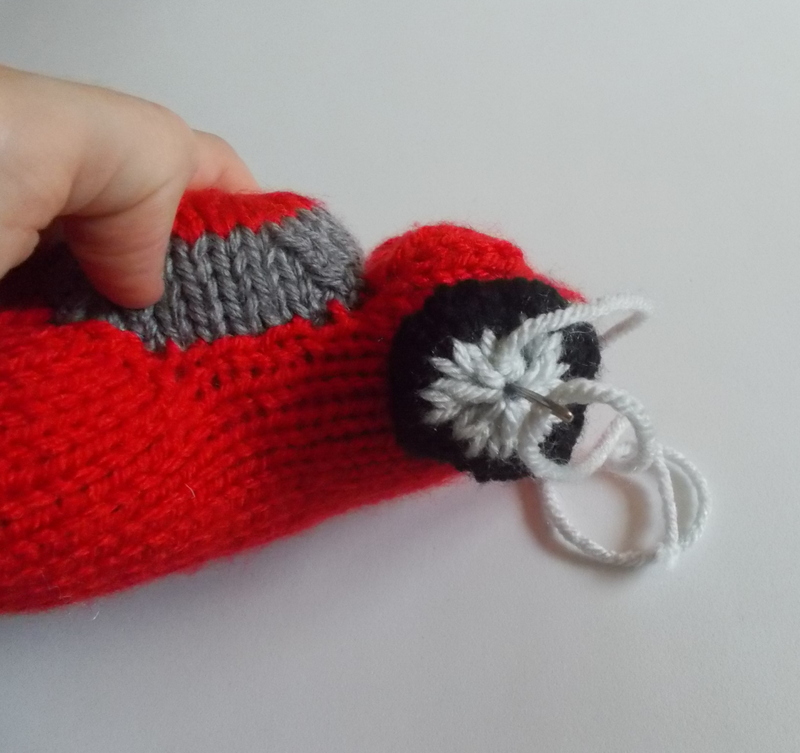 Previous PostRainy Days and Tuesdays …Next PostFree Pattern Fridays – Rocket Ship Reprint!